Gray Leonard was the Fall 2015 Communications Intern at CDT. The following was posted on CDT’s website to celebrate the relaunch of the Online Art Rights website. To celebrate the update of Online Art Rights – a CDT project that provides artists and others with a general overview of the legal landscape for art online – those of us at the DC office had a small party last Friday night. As the project lead, I was supposed to give a short presentation to introduce the site and describe my design choices, but I thought it would be more compelling to give a historical example of an artist that used restrictive expression laws to his advantage. To break up (very informative) walls of text on the site, I sporadically added artworks that had relevance to the subject matter. One of these works is Honoré Daumier’s Gargantua, and it was this work I presented. For Daumier, a popular political caricaturist in 19th century Paris, government censorship was part of the creative process. In November 1830, under the rule of Louis-Philippe, laws limiting the freedom of the press were implemented that “made press attacks against royal authority or against the person of the king punishable by fines or imprisonment or both.”  The artist reacted to these laws by testing the boundaries of visual representation. 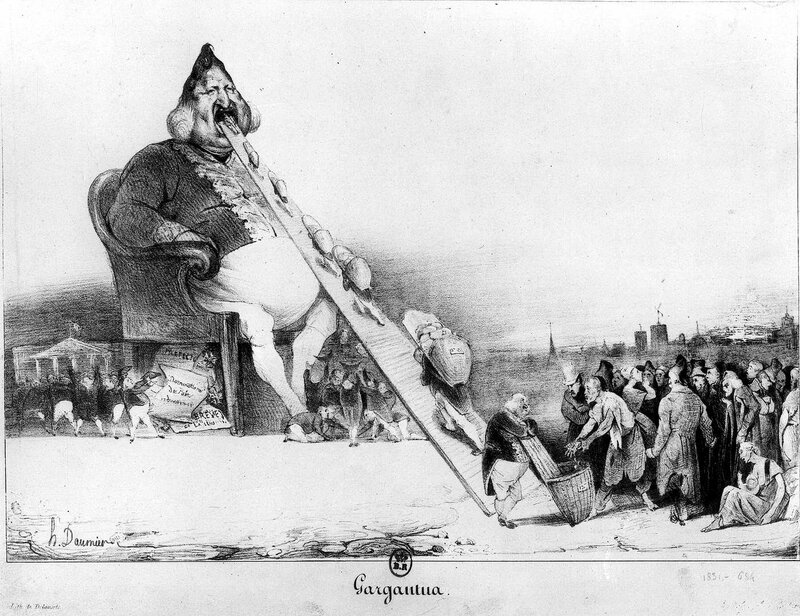 Daumier’s 1831 Gargantua is a deriding portrait of not only the king but of the political situation at the time: Louis-Philippe, portrayed as Rabelais’ gluttonous giant Gargantua, feasts on the taxes of the lower classes via ministers who carry the coins up a ramp that leads to the giant’s mouth. The royal family is huddled below Gargantua, grasping for coins that signify the stipend they were given for their support. At the same time, Gargantua is “producing” documents that give monetary awards to various civil and military persons – a controversial policy at the time. Daumier’s work provided a critique of the king and his government that arose from real societal discontent within the working and lower classes. In November 1831, the portrait of Gargantua was seized and ordered to be destroyed. Daumier, his publisher, and his printer were arrested and charged with “arousing hatred and contempt of the king’s government, and by offending the king’s person.”  Undoubtedly, the unapologetic and incensing political message of the work led the government censors to act – an image could be disseminated more easily than writing. Daumier defended himself by arguing that, rather than portraying the person of the king, he was symbolically depicting France’s corrupt political structure. While, of course, this wasn’t true – Daumier was poking fun at Louis-Philippe by portraying him as a gluttonous giant – his knowledge of the bounds of the law allowed him to defend his work from censorship. In the end, Daumier was fined five hundred francs and served six months in prison. This didn’t deter him: after his release, and for the rest of his career, Daumier created art located at the demarcation line of legality and illegality. His work, along with the publications he was printed in, was confiscated countless times by the French censors, always for the same reason: he knew the laws and explored their limits. Online Art Rights allows artists to educate themselves on the often-complex limits of artistic freedom. In today’s exigent political circumstances, where attacks – legal and physical – on art and free expression are as real as they were in the 19th century, it is crucial that artists have the ability to create and explore within the fullest range allowed by the law — or even a bit beyond — to not only defend but expand the discursive limits of their societies. Elizabeth C. Childs, “Big Trouble: Daumier, Gargantua, and the Censorship of Political Caricature,” Art Journal, Vol. 51, No. 1, Uneasy Pieces (Spring, 1992), pp. 26.